Stands Out- This Christmas inflatable stands at 15ft tall making it one of the biggest and most attractive inflatable Christmas decorations around! Illuminates Holiday Cheer- This Christmas inflatable comes with a set of interior lights to illuminate your yard for maximum joy that the whole neighborhood can see and enjoy! Inflates Quickly- Simply attach your blower fan to your Christmas inflatables and plug it in and your inflatable Christmas snowman will be ready to spread joy in seconds! 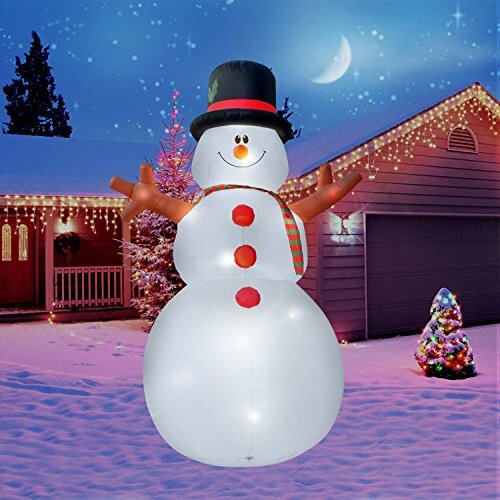 Easy To Set Up- Inflatable Christmas Snowman includes all you need to set up quickly and easy including yard stakes, blower fan and tether ropes! If you have any questions about this product by Holidayana, contact us by completing and submitting the form below. If you are looking for a specif part number, please include it with your message.